Halfway between Antica Casteldurante, well-known for its traditional majolica and ceramic crafts, and Acqualagna, homeland par excellence of both the black and white truffle, you will come across a road gently embracing the hillside, climbing and looking out over the surrounding landscape. Once at the summit, you will find yourself in front of an old village church and a huge oak tree which seems to be its silent and unshakable guard. You will notice a deep sense of harmony and you will know that you have reached your destination. The Pieve Del Colle Organic Farm, Training Centre and Restaurant is a special place, where everything is exactly what it seems to be: from the orchard and farm which produces the organic ingredients used in the kitchen, to the home-made pasta and marmalade, to the cheerful and sincere welcome and the smiles of the landlords. There is nothing fake nor contrived to undermine the pleasure of your stay. That's why this is the ideal place for a break, especially with your family or children. Young visitors can explore the farm and learn about the animals, see the growing tomato or lettuce plants and discover nature. What’s more, the Silvestrini family often organises interesting projects or workshops which make the trip even more exciting for guests. 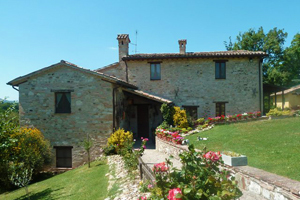 Agriturismo Pieve del Colle is in Montefeltro. This is a central position which can be used as a base for excursions and trips to the main sights of the area: Urbino, birthplace of the Italian Rinascimento, Urbania, Antica Casteldurante, famed for its valuable ceramics, Acqualagna whose truffles are exported across the world, La Rocca di Gradara where the tragic love story of Paolo and Francesca unfolded, and the Adriatic Riviera with its bars and white beaches. 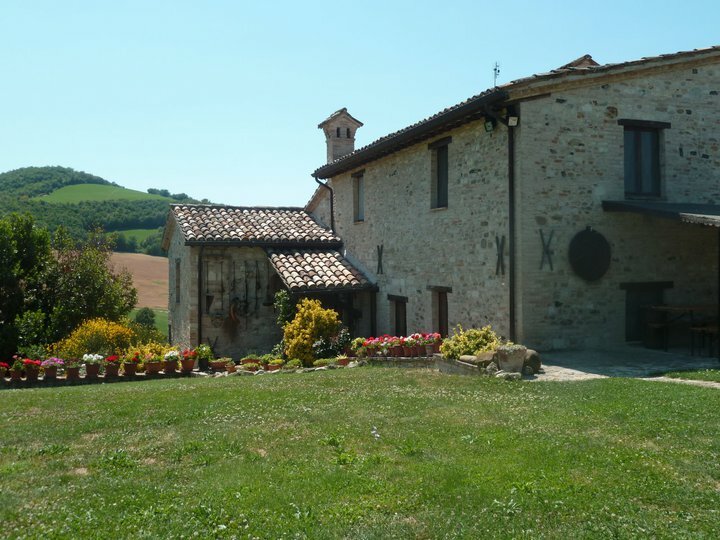 Agriturismo Pieve del Colle has 5 rooms. Each one has been decorated in a different colour which matches a theme, wooden furnishings then add a welcoming touch to all of them. From each room, you will see views of the surrounding countryside: Urbania, Sasso Simone and Simoncello, the Pieve and its two centuries-old and formidable oak trees, as well as the Monte Nerone. Each room has a private bathroom and heating system. The dining room is large and welcoming. In the summer, the atmosphere is fresh and pleasant, while in the winter you can warm up by the fireplace where you'll always find a fire crackling cheerfully. This is the place where Isabella and her family serve their hand-made delicacies. The Agriturismo’s kitchen prepares traditional dishes but also offers vegetarian options, all made with organically-grown produce from the farm. The farm produces everything from bread, cooked in a wood oven from home-grown wheat flour to Sambuco or Rosa Canina marmalades. They rear sheep, cows, chickens, pigs and donkeys and produce wines, flavoured grappas, salamis, pickles and vinegars. The Silvestrini family will be happy to give you a tour of the Agriculture Museum and the Training Farm. Disabled access is available for La Casina and the restaurant. La Casina Apartment € 104,00 per night. Linen and towels are included. In this formula breakfast has a supplement of 5,00€ per person. children 2-3 years old € 6,00 per meal.